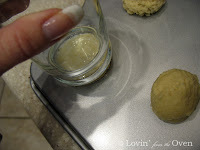 Frieda Loves Bread: A Round Valentine Sugar Cookie..the easy way! 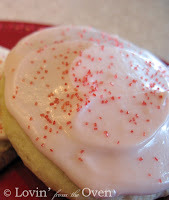 0 A Round Valentine Sugar Cookie..the easy way! I made sugar cookies last night. The easy way. Meaning, I did not roll, cut, re-roll and cut my cookie dough. 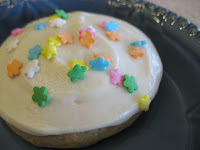 The sugar cookie dough I use is a very soft, sticky dough that requires chillin' in the fridge and some extra flour for handling. 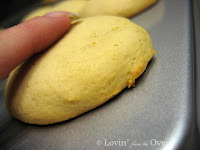 I have noticed that when I use flour to roll my dough, my cookies are slightly heavier in texture. 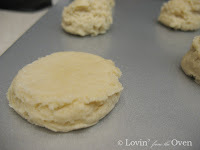 I can't remember where I got this idea, maybe from flattening cookies for another recipe, but I thought, why not? 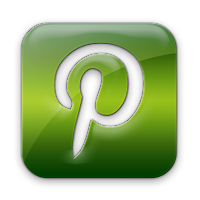 Why not try this with sugar cookies? It worked like a charm! It was sooooo easy! Easy peasy! The cookies were tender and light...melted in my mouth! 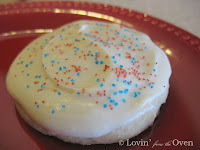 I now do this every time I want a simple, round, quick, soft sugar cookie that I can decorate any way I want. This recipe is the same one that I used in an earlier post. 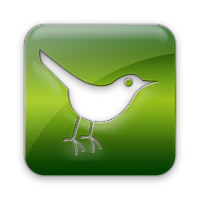 Look for it here. My friends have said these are better than Granny B's cookies. Once you have tried these, you won't want to go back! 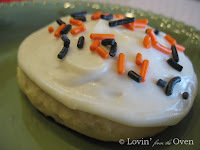 For these round cookies that require very little decorating, I like to use the creamy Butter Frosting listed below. After the dough has chilled for at least 30 minutes, I use a 2T. cookie scoop and put it on the bottom of my non-stick cookie sheet. Why on the bottom? No sides on the baking sheet ensures even browning/baking of your cookies. 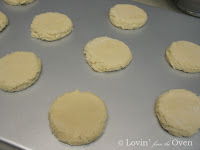 You can grease a cookie sheet or use parchment paper. 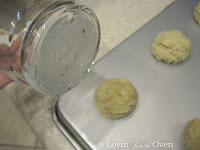 I flour the bottom of a drinking glass (this one is about 2 1/4") by touching the bottom of the glass to my chilled dough and sticking it in the flour. I press evenly and gently onto the scooped cookie dough. I keep pressing until I see the dough coming out; making it approximately the same diameter as my drinking glass. See, no rolling and cutting out! These cookies can be put closer together as they don't spread out much. I bake these in the oven and test for doneness. Cookies should barely be turning brown. Touch the tops...if it springs back like a cake, it's done. 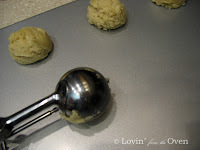 If the dent stays, it needs more time....or....you need to press down your cookies a little more to make them thinner. 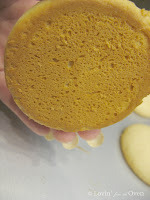 The bottoms can be lightly brown. I can't wait to eat one. They're good without frosting! I CAN'T wait for Spring!!!! 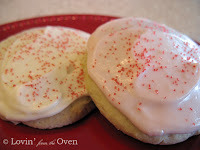 Or a Pink/White Valentine cookie! Really, you can make these cookies anytime...for any reason!